Owning a property, whether for residential or business use, is not an easy feat. Constructing the establishment alone requires a lot of time, resources, and effort. This is why it’s important that we take measures that will help add years to the life our properties. Power washing services in Massillon, OH is one of the most effective ways to maintain the appearance and value of both residential and commercial establishments. However, pressure washing services in Massillon, OH is best left in the hands of the people who know how to do the job right. If you are a business owner in need of pressure washing services in Massillon, OH for your establishment, turn to Wilhelm Power Washing. Our company has more than four decades of experience in performing property painting and pressure washing cleaning in Massillon, Ohio. We use advanced and high-powered washers when doing pressure washing services in Massillon, OH to get rid of contaminants that can damage your property. What Are the Benefits of Getting Power Washing Services in Massillon, Ohio? The appearance of your establishment speaks a lot about your business. A well-kept space can help attract more customers and keep existing ones. On the other hand, a filthy-looking commercial establishment may give your business a bad reputation. Check your commercial space from the outside to see whether it’s time for pressure washing cleaning in Massillon, OH. Contaminants such as molds, mildew, mud, dirt, and dust can damage your property in the long run. If you see any of these elements, call a company that provides pressure washing services in Massillon, Ohio. With pressure washing cleaning, Massillon, OH business owners can restore their properties to their glory days. Without proper maintenance, mildew, moss, mold, or algae can accumulate on your property. These contaminants may cause illnesses such as throat irritation, coughing, nasal congestion, eye irritation, and other allergies. Pressure washing services in Massillon, OH can help eradicate these contaminants and prevent your employees and customers from getting sick. You invested time and money to construct your building. However, without proper maintenance, you may end up spending more money for repairs and restoration. 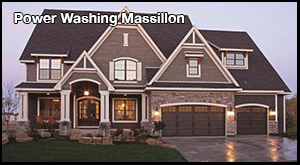 Preventive measures, such as power washing services in Massillon, OH, can preserve your property’s curb appeal. Aside from removing dirt and other impurities from a surface, power washing services in Massillon, OH can protect the paint on your property. Running a business can take much of your time. Maintaining your property can also keep you busy. Your in-house maintenance team may not have the expertise and tools needed for power washing cleaning in Massillon, OH. Save yourself the hassle by calling professionals who specialize in power washing services in Massillon, OH. These experts can help you retain the aesthetic appeal of your building. Leave pressure washing services in Massillon, OH to the hands of the pros, so you can devote your attention to your customers, business, and employees. If you are looking for a reliable company that provides high-quality power washing services in Massillon, OH, contact Wilhelm Power Washing. Our company is staffed by professionals who are experienced in performing power washing cleaning for Massillon, Ohio establishments. Get in touch with us at 330-477-7094 or 330-323-7466 to ask for an estimate for our power washing services in Massillon, OH. You may also email us at dwilh51183@yahoo.com to schedule an appointment for power washing cleaning in Massillon, OH. We will respond to your message promptly. Our team is looking forward to hearing from you! Since 1973, Wilhelm Power Washing has been providing expert power washing and house painting service to both residential and commercial clients in Northeast Ohio. Our dedicated staff has more than 40 years of combined experience.